I was absolutely fascinated by the acqua alta, or high water in the lower streets in Venice. It laid out for me the engineering feat that building this city was- and the ongoing challenges as well. Not sure how to express this sentiment but I’ll try- even though it’s surpassingly beautiful, the sheer will, determination, and stubbornness of the long ago Venetians to build a city in the water impresses me even more. 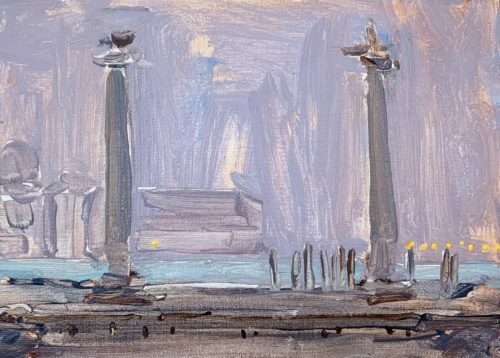 This entry was posted in Landscape Paintings, Urban Landscapes and tagged 5 x 7 inches, italy, oil on linen on panel, piazza san marco, venezia, venice on October 27, 2015 by Kevin. I just got back from a 2 week painting trip to Italy, which was beautiful. There was a lot of weather, which is a nice change coming from sunny California- though there’s only so much painting anyone can do in pouring rain. 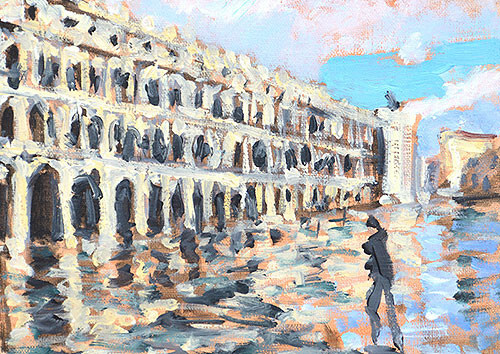 I was really taken with the acqua alta or high water in Venice, especially in Piazza San Marco. Hardy souls with galoshes or wet feet splashed through it, but my goal was to keep my feet dry. That was not an easy task, because some of the streets were flooded too. Here’s Piazza San Marco, flooded in sun. I also saw it flooded in rain and with puddles at night- as well as dry in all kinds of weather. And yes- it’s not a very accurate drawing. I shortened the campanile to fit on the panel, among other things. 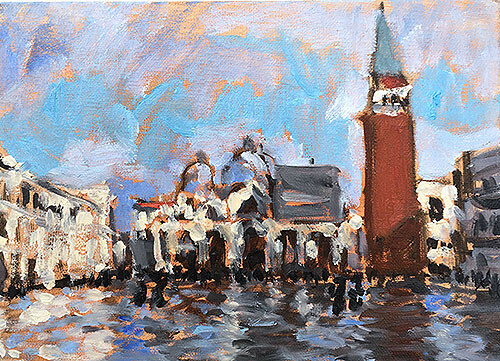 This entry was posted in Landscape Paintings and tagged 5 x 7 inches, italy, oil on linen on panel, piazza san marco, venezia, venice on October 20, 2015 by Kevin.